Veganism is all over the UK press at the moment. With the rise in popularity of the Veganuary initiative – committing to go vegan for the month of January – magazines and newspapers are bigging up their pick of London’s vegan-friendly restaurants. But, a lot of the suggestions, I think, are a bit of a cop out! Recommendations such as pizza places serving you a Marinara, i.e. a pizza with a tomato sauce, some oil and herbs, are far from inspiring for me. Or, suggesting visiting a restaurant where there is one delicious vegan side dish on a predominantly meat-oriented menu. I can understand the reason for listing eateries that cater for meat eaters and vegetarians/vegans alike, in that you still want to be able to eat dinner out with your carnivorous friends should you choose to become vegan in January and beyond. However, a cheeseless pizza doesn’t excite me. Neither does the prospect of a lonely vegetable side dish. I have taken on the Veganuary challenge this month. When I eat out as a temporary vegan, I want to feel excited when I pick up that menu. I want numerous options to choose from. I want something tempting, creative and satisfying to eat. I want to guarantee that when I turn up to a restaurant that my dietary requirements have been catered for; I don’t want half-arsed, ill thought-out food. That’s why, I would much rather go to a wholly vegan (or vegetarian) restaurant. Some of these places may be obvious to those already familiar with London’s meat-free dining scene. But they’re worth a mention, in case you’re new to the veg game. Itadaki-zen: for organic and vegan Japanese dining. The first vegan Japanese restaurant in Europe, in fact. Despite being situated in the central chaos of Kings Cross, this small restaurant exudes both tranquility and quality. We arrived around 9pm on a Tuesday night and the place was almost full. With an extensive menu, you can expect to find deep-fried goodness in the form of vegetable tempura and spring rolls, freshly-made, aesthetically-pleasing sushi maki rolls filled with exotic mushrooms, avocado and raw vegetables, udon noodles in a vegan-friendly broth topped with tofu steak, as well as a wealth of organic, vegan wines. I’d recommend the Itadaki-zen bento box as you can try a range of dishes that way. Main courses start at around £12. Vanilla Black: for an unforgettable fine-dining experience. Recommended in the Michelin guide, this is the place to try inspiring, innovative and unusual flavour pairings from an ever-changing, seasonal menu. Not everything is vegan on their main menu, but helpfully, they do have a separate vegan menu. Every detail is thought about: the food is presented beautifully, brought to you by friendly, welcoming and attentive staff. I even marvelled at the lovely crockery and glassware on both of my visits. Also, if you’re on Instagram, you must follow Vanilla Black’s account. The owner, Andrew Dargue, posts up behind-the-scenes photos of their food, interspersed with hilarious, everyday musings. Also, Andrew always likes my Instagram photos, which brings me joy. Two courses for £31. Three courses for £41.50. Treat yo’ self; have three. Ethos: for colourful salads and gourmet buffet grub. This elegant, pay-by-weight buffet restaurant is a stone’s throw from the hustle and bustle of Oxford Street. With indoor trees, marble tables and striking blue decor, the restaurant is spacious and modern. As about 50% of its menu is vegan-friendly, Ethos offers a wealth of vibrant, animal-free dishes. The salads have Middle Eastern and Meditteranean influences, there are plenty of homemade dips like houmous and guacamole on offer, and hot dishes using fresh vegetables and pulses. Oh, and vegan cakes and sweet treats of course. Depending on how big your eyes and belly are, you can get a decent plate of food for about £14. My tip is to pick the less weighty options like salads to get more bang for your buck. Buhler and Co: for a hearty, meat-free brunch. This compact, vegetarian cafe on the busy Chingford Road in Walthamstow makes the best use of its space. What was probably previously a ground floor flat has been made into a light and airy eatery, with a Scandinavian feel: white walls, low-hanging light fittings, lots of green, leafy plants, and simple, wooden furniture. This feels like an exciting place to be. With a small room up front, a covered garden with heaters and a small room out the back, you’ll find space to have a decent coffee and a delectable brekkie. Try the vegan version of their Indian-inspired vege fry up, and a soya flat white on the side. From £5.50 (cheaper if you just want toast). Ottolenghi: for sensational vegetable small plates. Okay okay, so I’m cheating a bit with this choice. This isn’t a vegan restaurant, it’s not a meat-free restaurant, but oh my, is it worth a visit. Ottolenghi is one of my idols: the king crusader of vegetables playing the hero on the plate, his restaurants are top notch. I mean, I’m a huge fan of vegetables, but never had I thought they could taste as good as they did when I visited Yotam Ottolenghi’s Islington restaurant. Small plates of the freshest of ingredients, cooked to perfection. As some of his vegetable dishes are cheese- and yoghurt-oriented, call ahead and ask about vegan alternatives. £30-£40 a head for sharing plates and wine. Other tried-and-tested big veggie players you should visit: The Gate, Mildreds, Manna, Amico Bio. The new vegan fried chick’n shop everyone is talking about: Temple of Hackney, which is, funnily enough, in Hackney. The community Hornbeam cafe, Walthamstow, which uses local-sourced, organic produce. South Indian vegetarian restaurant, Rasa, in Stoke Newington, Hackney. I’ve been to the non-veggie sister restaurant off Oxford Street, but I’m intrigued to try the 100% veggie place. Have you visited a vegan/vegetarian restaurant that I shouldn’t miss out on? Please comment below if so; I’m always looking for new places to try. Happy New Year to you! If, like me, you have decided to take on the Veganuary challenge, I’m sure you’re looking for vegan recipe inspiration all over the web. After a week back at work following Christmas, I wanted to treat myself to a tasty and rich breakfast at the weekend. I’ve found so far on my vegan journey that cooking involves a fair bit of planning. However, I put this recipe together with just a couple of vegan staples and otherwise usual storecupboard ingredients. These pancakes accidentally taste like banana bread. I added mashed banana as an egg substitute, but unknowingly, it also adds extra natural sweetness which is a real treat. The banana is also a great energy booster. I used coconut milk as I wanted my pancakes to be creamy and sweet, but you could use any dairy free milk depending on your preference. A lot of recipes recommend almond milk; I imagine its nutty, earthy flavour would contrast well against the sweet banana and sugar. The self-raising flour and baking powder together make these pancakes so light and fluffy. Eating them made me feel like I was in the film, Matilda. Whenever I think about thick, American-style pancakes I think of that film. It’s one of my faves. I adapted this from a non-vegan recipe, which says it should make 4-6 servings. But my version serves 2! Sift the flour, sugar, salt and baking powder into a mixing bowl. Mash the banana in a jug or bowl and pour in the milk. Stir well with a metal spoon and then add the olive oil. Stir again until smooth. Don’t worry if there’s an occasional lump of banana. Tip the milk and banana mix into the dry ingredients and whisk well, until you have a thick batter. Put a large non-stick frying pan on a medium heat and add a knob of dairy free spread. When it’s melted, pick the pan up and move the spread around so it covers the base of the pan. Add slightly less than a ladleful of pancake mixture at a time. You should be able to fit three pancakes in the pan. Cook until golden, roughly 3-5 minutes on each side. Flip them over with a fish slice. When they’re cooked, remove them from the pan and either put in the oven on a low heat to stay warm, or put to one side. Repeat this process until you’ve used up all the batter. 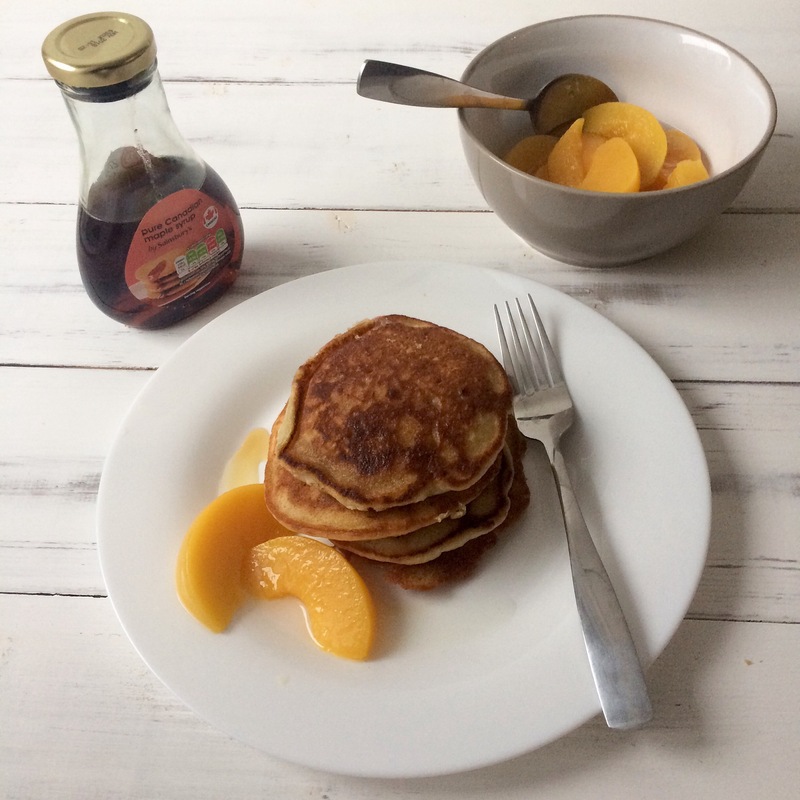 Serve stacked on a plate with a drizzle of maple syrup and your favourite toppings. I recommend washing them down with a fresh cup of coffee. This recipe was inspired by BBC Food.